I always, always advocate for researching assisted living, or any other senior living/care options – using State resources, when available. Too often, websites come up when doing a search for assisted living that are less-than-scrupulous, and that usually have an ulterior motive of collecting your personal data, or selling you something. State-resources are generally (well, always in my experience) safe, and thorough ways to research assisted living options. The State of Illinois has recently changed things around on their Department of Public Health website. 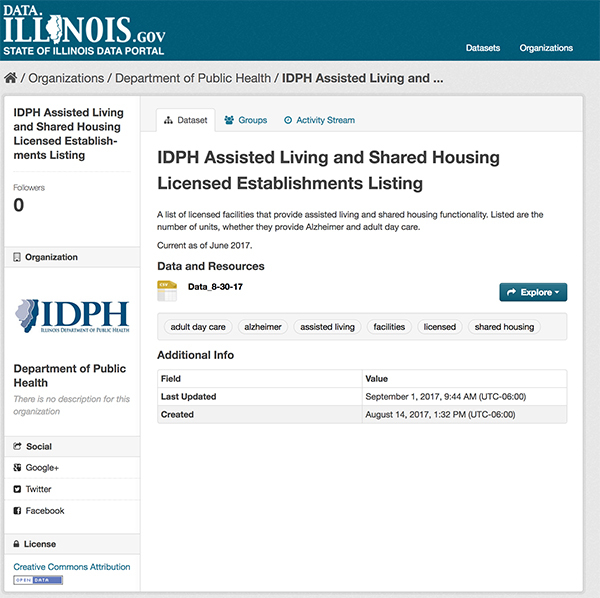 It used to be that they had a very good interactive database of all assisted living, memory care / Alzheimer’s units statewide. While this is generally still the case, it has been pared down, or simplified somewhat. 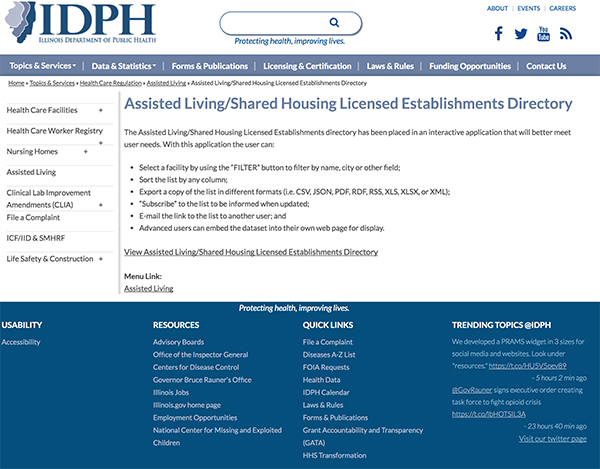 It is still available to the public, and offers a thorough list of all licensed assisted living establishments Statewide. This is the new/different section I was talking about. It’s now more of a list, but with some sorting and interactivity features still intact. 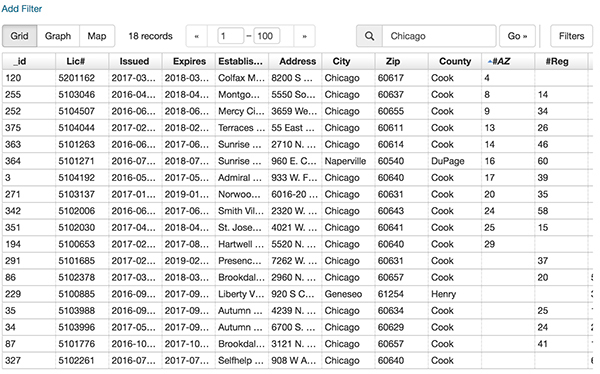 Sort by License Number, ID, Establishment Name, Address, City, Zip Code, County, # of Alzheimer’s Units, Regular Units, Total Units (or capacity) and whether Adult Day Care is offered. This part was very easy, and this is where this database proves to be incredibly useful. 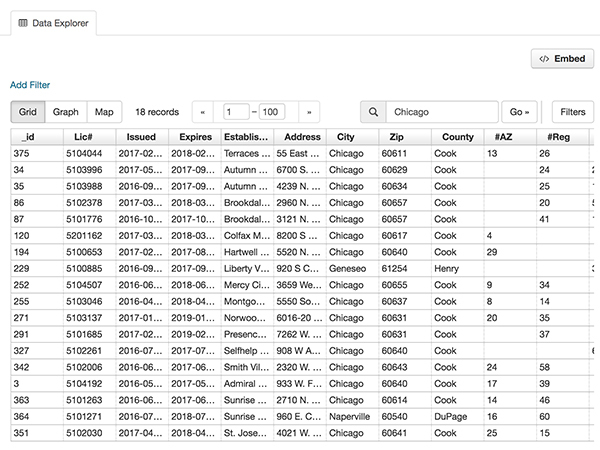 You can simply use the ‘Search Data’ feature to enter a city name (i.e. Chicago) and from there, a list specific to the city will be displayed. 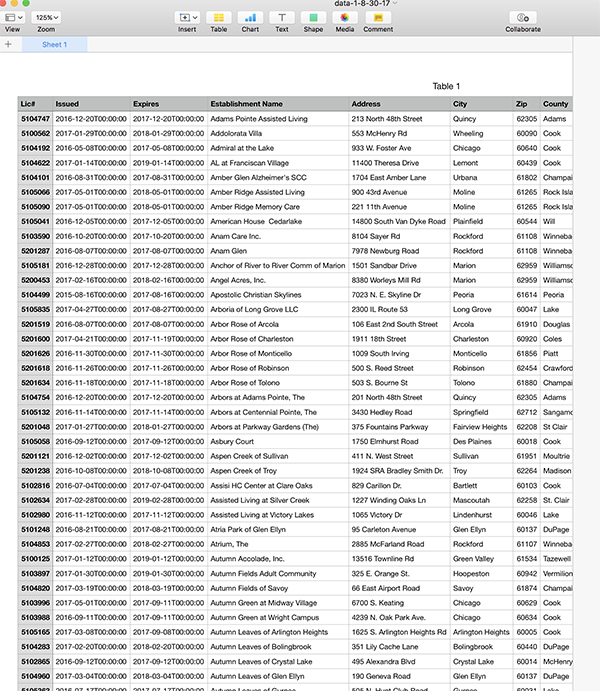 You can then select any one of the columns, for example, #AZ (which tells you how many Alzheimer’s beds are available), and the list will be arranged by that criteria. 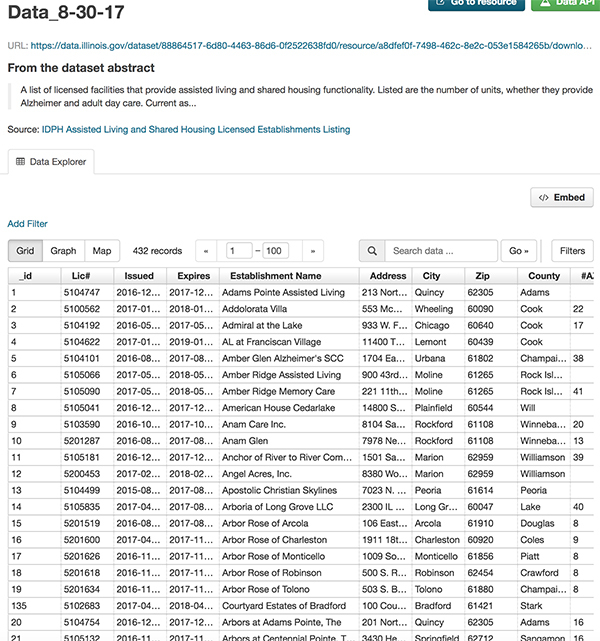 Another really great feature of this website and the data it provides is that you can easily download the list of facilities into a .csv document (comma separated values). To get this list, you simply need to be on the main page (referenced above) and then, instead of selecting ‘Preview’ you’ll select ‘Download’ instead. The downloaded list is malleable as well – meaning that you can filter, arrange and sort before you print. Some people like the ‘old school’ printed list, as it may be useful as you are driving around visiting different communities, you can easily take notes, or have some of the basic facility data with you so you may ask questions and verify the data that you have. 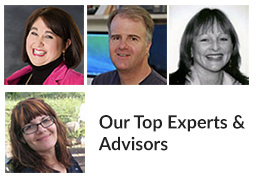 To learn more about assisted living, visit our Research Guides section!